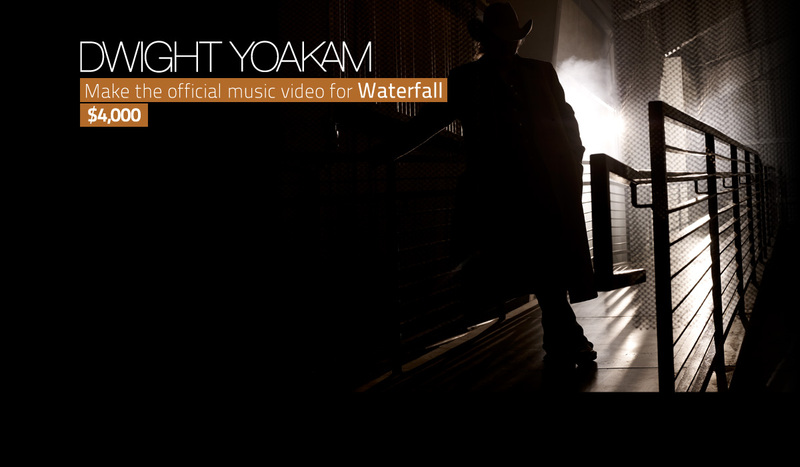 Dwight Yoakam wants you to make the official music video for one of his latest tracks Waterfall. Yoakam's forthcoming album, 3 Pears, blends his Kentucky influences to create a potent fusion of country and rock. Deadline for entries is 3 September 2012, 23:59 GMT time. The winner will receive $4,000 and have their video used as the official music video for Waterfall. Outstanding videos will also be nominated for the 2012 Genero Awards and in the running for $25,000 in prizes. The winner and finalists will be chosen by Dwight Yoakam, Warner Bros. Records and Genero. Few entertainers have attained the iconic status of Dwight Yoakam. Perhaps that is because so few have consistently and repeatedly met the high standard of excellence delivered by the Kentucky native no matter what his endeavor. His name immediately conjures up compelling, provocative images: A pale cowboy hat with the brim pulled low; pouredon blue jeans; intricate, catchy melodies paired with poignant, brilliant lyrics that mesmerize with their indelible imprint. Then there's Yoakam the actor, who seemingly melts into his roles, impressively standing toeto- toe with some of the world's top thespians: Jodie Foster, Tommy Lee Jones, Forest Whitaker, Nicholas Cage. Add to that Yoakam the entrepreneur and you have a singular talent without peer. It's no wonder that Time Magazine dubbed Yoakam "A Renaissance Man," or that Don McLeese, in his 2012 biography "Dwight Yoakam: A Thousand Miles From Nowhere," called him a "musician who has established himself as a visionary beyond time" and "an artist who could title an album Tomorrow's Sounds Today and deliver it." But that's getting ahead of the story. Yoakam's latest album, "3 Pears," is a deftly forward-looking amalgam of all he has accomplished to date as a recording artist. Produced by Yoakam, the Warner Bros. project includes unexpected collaborations with Beck, who co-produced two tracks, and Kid Rock, who co-wrote the hooky opener, "Take Hold Of My Hand." Balanced by buzzing guitars and vulnerable ballads, the album finds Yoakam exploring the emotional extremes of his musical persona, all delivered with a revealing honesty. "Heart Like Mine" puts a country garage-band spin on a Monkees-like melody, while "Dim Lights, Thick Smoke (And Loud, Loud Music)" – written by Joe and Rose Lee Maphis and closely associated with the Flying Burrito Brothers – is thrashing, 21st-century cowpunk. "Waterfall" takes an unusual, dreamy look at embracing intimacy, and "Long Way To Go" – presented first as a gently chugging lope and later reprised as a stark piano/vocal performance – elegantly refines the concept of personal commitment. At the core of Yoakam's creative expression is an unwavering desire to articulate human connection. His musical, theatrical and entrepreneurial efforts are merely different facets of Yoakam's singular devotion to discovery of himself and the world in which he lives. As he told Newsweek, "I'm committed to an earnest exploration of life, no matter what medium I'm using."